Greg Atkinson wrote a good blog item called “Digital Real Estate.” He admonishes churches and pastors to be proactive in reserving names for themselves on key social media sites, like Facebook and Twitter. I’ve written about the need for churches to reserve a domain name for themselves, even if they don’t intend to use it right away. Domain names are very cheap real estate. If you find a name you like, I suggest reserving it for 10 years or longer. At NetworkSolutions.com, you can do that for $180, a 48% discount from the one-year rate. Network Solutions is good about bugging you when it’s time to renew. Unfortunately, every year one or two UB churches forget to renew their domain name, and must start over with web and email addresses. But some real estate is free. We’ve reserved several Twitter accounts which we don’t currently plan to use (ubyouth, ubwomen). I just wanted to get possession of the names. Likewise for Facebook (as Greg Atkinson points out). If blogging interests you, get a Blogger.com account in your name. Just focus on the most popular sites. You might want to get a Gmail account in your church’s or your personal name, or Flickr. Keep on the lookout, and make sure you write down the login name and password, especially if you don’t plan to use it right away. 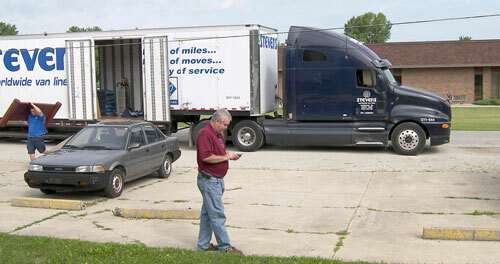 Phil Whipple makes some phone calls in front of the moving truck, which is in front of the UB offices. It’s moving-in day for Bishop-elect Phil and Sandy Whipple. For now, they are moving into apartments right across the street from the UB offices. Huntington University owns those apartments. They hope to eventually move into the home which Bishop Ron and EJ Ramsey have been renting from Huntington University for the past four years. The Ramseys, meanwhile, continue having trouble with the house-hunting process. Yesterday, they had to withdraw from an offer they had made when, during the inspection, they learned that the home wasn’t quite what it was advertised to be. So back to square one. They could use your prayers, that God will lead them to the right place. We have ministers who are at the strongholds where Satan lives in their city. They know that to break the strongholds hindering their churches, they have to deal with certain issues. And they’ve taken them head on. They would charge hell with a water pistol, because they know that Ron and I stand behind them. Though they’ve been bloodied, they feel they’ve been loved on and they’ve learned some powerful lessons through it. One pastor has gotten beat up badly, but we stood with him and talked straightforwardly with his people about some issues. Some of our pastors are just as straightforward as we are. I’m proud of them. They’ve learned some powerful lessons about tempering their straightforwardness with care and tenderness, and God is doing things in their churches. We’ve had people be pretty caustic with us. Most times we find that when we follow the Lord’s agenda and processes, he does the work, moving resistant people out of the way. In some churches, we’ve seen people turn and repent. I had a guy come ask forgiveness for something that happened 12 years. You see that and realize it’s God. Oak Harbor UB (Oak Harbor, Ohio) has changed its name to Shoreline Church. Steve Fish is the pastor. Oak Harbor is near Lake Erie. Over the last four years the subject of healthy churches has been sharp on my radar. I collected a file full of articles trying to describe the characteristics of a healthy church. I finally compiled all the ideas and want to share them with you. This is not the result of a research project and is not verifiable in that sense. It is just observations I have gleaned from a number of sources. Leadership was the top characteristic. (I lumped together a number of things pertaining to leadership under this heading.) This includes leadership in its many varieties–leadership that is biblical, empowering, proficient, fruitful, positive, Great Commission focused, has a God-focused vision, has integirity. (tie) Inspiring worship and discipleship/spiritual formation. (tie) Relationships/belonging/assimilation and strong biblical focus. In touch with God/prayer/God-empowering presence. I don’t know that I would have put them in exactly that same order, but I do agree that they are probably the most significant. One that didn’t make the top 5 or so was the functional structure component, which I believe is also very important. The former Mt. Tabor UB church near Hagerstown, Md., ha been closed for a few years. The building was recently reconstructed at the Washington County Rural Heritage Museum, which portrays life in the country around the 1800s. It was dedicated on Sunday, July 26. An article in the local Herald-Mail tells about it, with a number of photos. You’ve read multiple books on church growth, discipleship, evangelism, and leadership. I’ll bet you haven’t read one about local church communications…because there aren’t too many. Since this is a communication-intensive world, let me recommend “Less Clutter, Less Noise,” by Kem Meyer. Kem is Communications Director at Granger Community Church near South Bend, Ind. That’s a fast-growing, highly innovative church focused tightly on reaching lost people. I attended a seminar there, attended a service another time, and I read blogs by Kem and a few other Granger staff. It’s valuable being exposed regularly to people who aren’t merely doing church, but are passionate about reaching the lost. That emphasis comes through in “Less Clutter, Less Noise.” As Kem deals with communication strategy and technique (and she loves the cutting edge), it all comes from an outreach-oriented heart. That’s the context in which Kem operates. I’ve heard her speak in three different conferences now, and she has consistently conveyed the same attitude–an attitude toward everything we do in communications, and an attitude toward the people we’re trying to reach. Her main premise is something like this: people are looking for something that’ll make a difference in their lives, but they’re so bombarded with information and choices that they can easily miss the church’s message. We need to break through the clutter–not add to it. She deals with a number of issues, always with short (1-3 page) pieces. “Less Clutter, Less Noise” reads more like a blog than a book (which I’m guessing was intentional). You’ll find parts that don’t apply to you (as I did). But you’ll discover some important perspectives on “church growth” that you won’t find elsewhere. When it comes to pastoral assignments, we’ve had the opportunity to take time. Years ago, your pastor left one week and the new pastor came the next; that’s how our system worked. But now, many months may pass between pastors. Some of these interim times have enabled churches to realize what a pastor means to them. Sometimes, in reviewing their church profile, we’ve addressed some issues. If a pastor left in conflict or was pushed out, we addressed some of those issues before the new guy arrived. In other cases, we had interim pastors, like Ron Cook and Wayne Goldsmith, who did good work that was extremely helpful. George Speas came down to Freeport, Mich., and was able to assess that the church wouldn’t be able to sustain a ministry, and he led them toward the concept of closing down. For their situation, that was the most effective decision. They celebrated their history and ministry and now resources will be used to re-invest in the Kingdom as their legacy. It’s good when a pastor comes with an intentional plan, rather than as a savior, and uses the first-year honeymoon period to build some strategic things into the life of the church. Sometimes you get a new pastor without assigning a new pastor. I think Banner of Christ in Michigan got a new pastor. The Mike Caley I see now is different from the Mike Caley when I first visited there four years ago. Mike has shared how he had been discouraged. Since their consultation, the Lord has done a fresh work in Mike’s life and the life of the church. He is free, confident and the Lord is working mightily. Sometimes it’s not a matter of changing people, but of seeing people change. Today, Pam and I are celebrating our 20th anniversary. Neither of us are anywhere near the United Brethren office. In fact, I wrote this a couple days ago. You don’t think I’m working on my 20th anniversary, do you? We met at New Hope UB church in Huntington, Ind., when Pam was a student at Huntington University (I graduated in 1979, she in 1984). We were married at Emmanuel Community Church in Fort Wayne, just six months after we began attending there. It was the first wedding Denny Miller performed after he became Emmanuel’s pastor. In 1998, we were part of the core group which went out from Emmanuel to “restart” what is now Anchor Community Church. The core group met for the first time in our home. Dr. DeWitt Baker, former president of Huntington U, used to delight in all the couples who met while in college. I don’t know if Pam and I count, since our college years didn’t overlap, but I suspect Dr. Baker would have claimed us. Pam and I dated for five years before I realized that my Mom was right when she told me, “You’re in love and you don’t know it.” Anyway, it’s been a wonderful 20 years, and it went faster than I thought it would. I imagine 30 will be here before I know it. But I’m anticipating a lot more than 30. Some ministers, by passion and personality and giftedness, will never be anything more than a shepherd. They enjoy doing the hands-on ministry to people. History says they can grow a church only to what they can handle–about 100-150 people. So when that church grows to 150 and stagnates, the best thing we can do is put him back into a church of 75 and not see that as a demotion, but as how he can shine and be fruitful. It’s not about numbers. It’s about recognizing who he is, and not making it something negative. It’s how God wired him–his passions, his abilities. Then bring in somebody who can delegate to lead that church of 150.